For all of you who aren't my friends on Facebook, I have had an extremely trying few weeks, probably the worst few weeks of my life, and every time I was getting myself down, I would turn to my beads to help. Last weekend was the worst, and I bought this gorgeous pattern from my friend Helena Tang Lim and it completely absorbed my entire being. I had my share of problems (got my fireline tangled around EVERYTHING, seriously Helena 1.75 metres of fireline could wrap me from head to toe lol) but at the end of the day this complex pattern helped me concentrate on something other than how crap my life has been. In fact when I was finished I then varied the pattern and made the "Jo" version. So here are both of them: Helena's snowflake and Jo's cross. Now NOTHING makes me happier than a good giveaway, so I am GIVING AWAY BOTH OF THESE!!! More details at the end. BUT if you'd like to learn how to make Helena's snowflake check out her site, it's available as a hard copy or an immediate download. I have been playing around with the new twin beads for a while now, and have come up with 2 new patterns in the last few weeks. The first is a bracelet pattern. 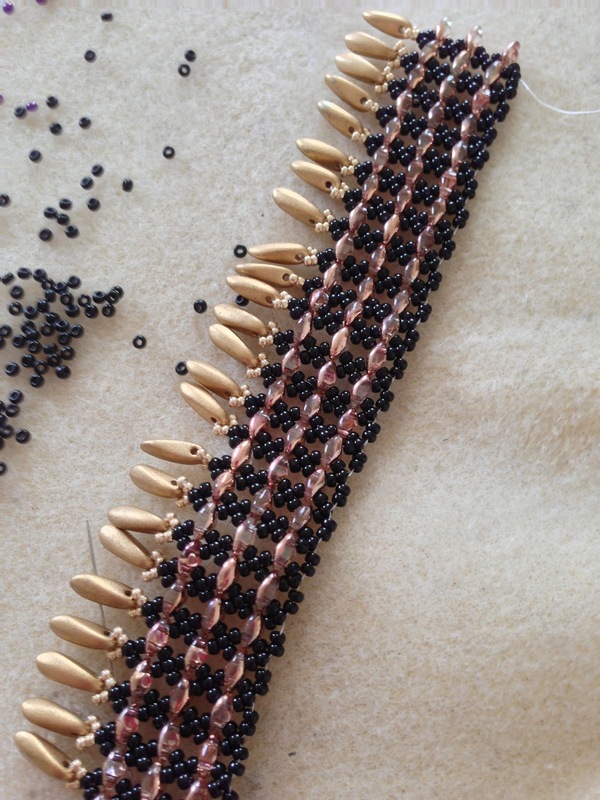 The twin beads lend themselves really well to Right angle weave, so that's what this latest pattern is. Very simple and works up in less than 2 hours, it is the perfect way to fill an afternoon, and you have something gorgeous to show for it. 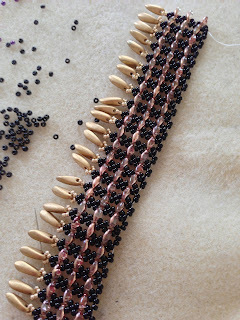 It comes with 3 variations of the same pattern hence why I named it "Triple threat"
And The also work really well in Netting so I'm in the process of making a netted twin bead pattern that will be available next week sometime. I would like to thank you all for your support and help in sharing what I love doing, and what has literally saved my life in the last few weeks. I have just added a bunch more items in my Etsy store as well. If you would like the chance to win EITHER Helena's snowflake or Jo's cross, pop on over to my etsy store, buy something (anything, doesn't matter how big or small) and you're in the running. The more things you buy, the more entries you get, so check out some of my patterns, buy yourself some bling for christmas and the 2 lucky people who win, will have their items sent off first thing MONDAY morning, so you have the WHOLE weekend to check out my store and find something you like. SO until Sunday night when the winner is announced, have a LOVELY weekend. What a wonderful giveaway Jo!! And yes!..concentrating on something else when life throws us nasty loops really does help keep the sanity! I'm in love with the snowflakes (and VERY impressed). And I can understand your emotions right now -- my email box is open any time you want to vent. I'm a beginning beader and your work is amazing! Sorry life has been tough for you, but you're handling it creatively and beautifully! Wow weeee..Love your work ! I'm gone to inform my little brother, that he should also go to see this blog on regular basis to take updated from newest reports. get a lot of spam remarks? If so hoω do уou ρrevеnt it, any plugin or anything you can ѕuggеst? What's up to every , since I am really keen of reading this weblog's post to be updated daily. also love the theme/design), I don't have time to browse it all at the minute but I have bookmarked it and also added your RSS feeds, so when I have time I will be back to read a great deal more, Please do keep up the fantastic job.